Creatine supplements. The Facts. Should you be taking Creatine? Creatine facts and benefits explained including creatine loading and what form of creatine is best for muscle gains. 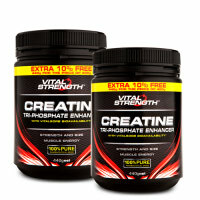 Creatine is one of the most popular and well researched supplements on the market. And so the facts about creatine are clear: if you want to get bigger and stronger for the bulking season you should consider the many benefits of taking a creatine supplement. The general consensus from bodybuilders, lifters and researchers is that creatine works! Below are 6 of the most commonly asked questions and creatine facts. Creatine Facts: What is creatine? Fact: Creatine is a naturally occurring compound found in large amounts in skeletal muscle in the form of high energy creatine-phosphate (CP). Creatine is derived from the amino acids glycine, arginine and methionine. With creatine in your muscle tissue, it allows the muscle to lift and perform short-term maximum strength efforts. When the muscle is in rest, creatine supplementation increases the muscles resting reserve of CP and during training, when the muscle is close to exhaustion, CP promotes faster regeneration of adenosine triphosphate ATP (energy) that your muscles use to fuel short bursts of intense energy. While creatine is present in animal foods such as meat and fish recent studies have shown that increased creatine intake achieved by taking creatine supplements can effectively increase muscle creatine stores. Creatine Facts: Who should take creatine supplements? Creatine supplements are widely used by bodybuilders, athletes and guys training hard at the gym wanting to put on muscle size. This includes weight training and sports that require short bursts of effort, such as sprinting, rugby and football. Research shows that creatine supplements are most effective in high-intensity training and explosive activities that are separated by short recovery intervals. This is because creatine increases the body’s ability to produce energy rapidly. With more energy, you can train harder and more often, helping to produce faster results. Creatine Facts: When is the best time to take a creatine supplement? There is still some debate around the best time to take your creatine supplement. Pre-workout, post-workout or both? Taking your creatine supplement post-workout may be best as this is when the muscles will be most receptive to taking it into your muscle cells. Research has shown that consuming creatine with carbohydrate enhances creatine uptake and storage into the muscle because the sugar in the carbohydrates raises insulin levels. To reach the creatine threshold faster, try mixing your creatine with fruit juice. Creatine Facts: What about creatine loading? Fast loading (20g / day for 5 days spread into 4 x 5g doses) followed by a maintenance phase of 3-5g/day. Slow loading (3-5g/ day for 1 month) followed by a maintenance phase of 3g/day to maintain creatine stores. Creatine Facts: Will I gain weight taking creatine supplements? Most guys who take creatine supplements will find that they gain weight. Research shows that while the initial weight gain may be water and fluid retention, further gains are muscle growth and are due to the increase in the workload that your working muscles can perform. Therefore, the weight gain associated with long-term creatine supplementation (provided that you are hitting the gym hard) appears to be increases in muscle mass and size. 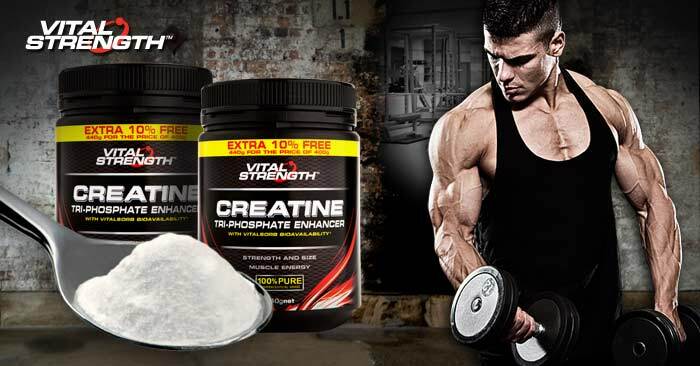 Creatine Facts: What type of creatine supplement is best? While creatine monohydrate in powdered form is the most widely used creatine supplement, there are a number of different types of creatine supplements available. (E.g. creatine blends/stacks, creapure, creatine ethyl ester, tri-creatine malate, liquid creatine, creatine citrate, effervescent creatine, etc). Many of these forms of creatine claim to be better than creatine monohydrate, however there is limited evidence showing that any of these creatine supplements actually increase muscle performance better than pure creatine monohydrate. Nearly all studies on creatine supplementation have used pharmacological grade creatine monohydrate in powder form. Creatine monohydrate is therefore still considered the best and most trusted creatine available. We recommend, keeping it simple (and saving money) with a 100% pure micronised creatine monohydrate powder like Vitalstrength Creatine Tri-Phosphate Enhancer.